We don’t get the newspaper any more. It isn’t that I’m filling the gap by getting local news online. Quite the contrary. We watch two different local TV stations over the lunch hour to find out what is going on in our area while watching national news channels during the day for a broader range of news and current events. Honestly, I miss the having a newspaper to thumb through daily. The reason we don’t receive it is simply financial or more specifically, financial-adjacent. We would take advantage of promotions to receive the newspaper for a designated period of time but the small print would say something like “holiday editions of the paper are calculated at twice the cost of a regular paper.” I hate fine print like that. I get that the holiday papers command a premium, but I simply think it’s poor customer service to treat your paying customers with such disrespect. And apparently, I hold grudges because this happened several years ago and it still annoys me. Alas, I had to say goodbye to the news, Sunday comics and coupons, among other things. The strangest thing is that I actually miss the puzzles. I’ve always been a fan of word search and cryptoquotes and in the latter part of my life, I’ve actually looked forward to Sudoku and the crossword puzzles. Of course, who doesn’t love the puzzle where you have to find the differences between the two pictures. 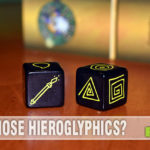 Since I love board games so much, it only makes sense that I would enjoy a game that plays on this same concept and that’s what we found! 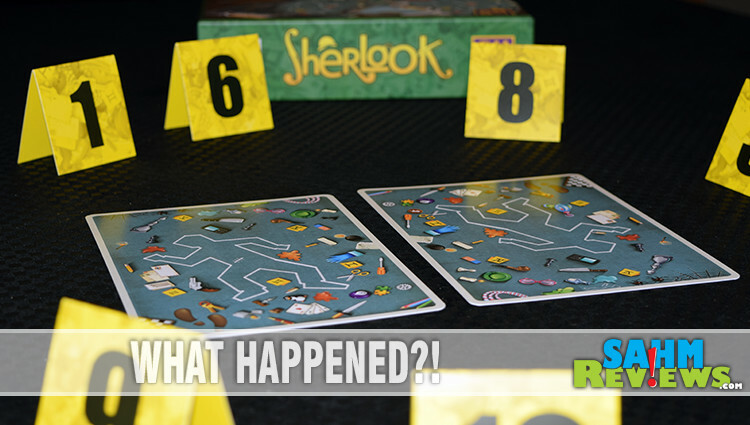 In Sherlook from CMON, you’re working at a crime scene. When you stepped away, some rookie messed up the scene. It’s your goal to discover what is different between the two images. 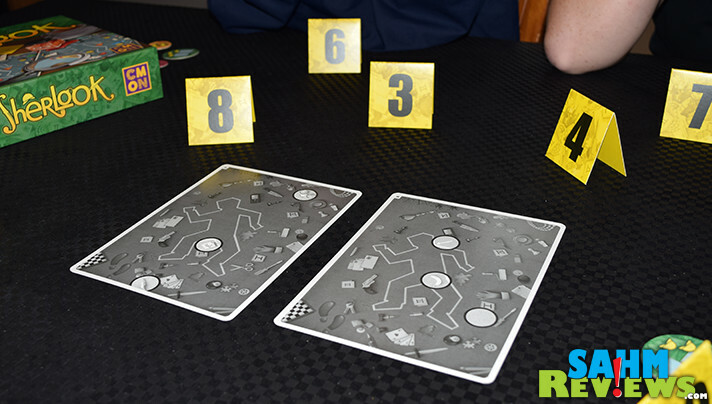 The game consists of only a handful of components including images of the crime scene, evidence markers and scoring/placement tokens. To set it up, all you need to do is shuffle the pictures and place them color-side up near the center of the table to form a deck. 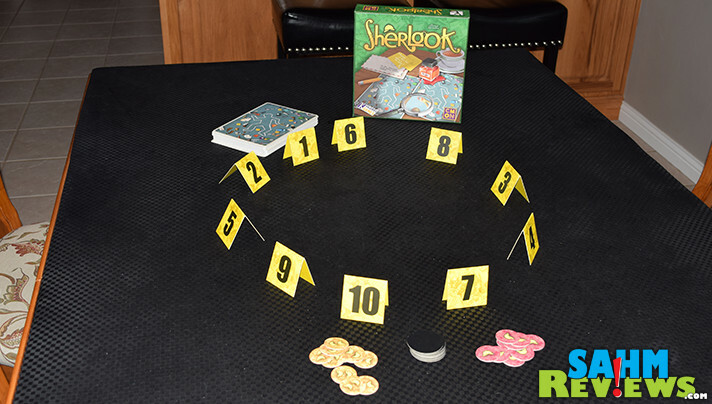 Place the evidence markers in a circle surrounding the area that will become the crime scene. 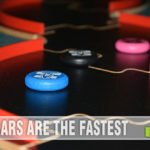 Divide the scoring/placement tokens into three separate stacks based on their color then flip the green ones face-down. You’re ready to go! At the beginning of a turn, flip over the top scoring token from the green stack. You’ll notice that it shows two picture cards and how they’re aligned. They’ll either be in a specific position and orientation or randomly thrown on the table. Since everyone has been able to see the top picture card on the deck, move it to the bottom of the deck. Take the next two pictures and place them in the middle of the evidence markers. I said you were ready to go before, but really… THIS is when you’re ready to go. So GO! This is when you need to call on your observation skills. Check out the two images and try to mentally determine how many differences there are between the two. You’ll have to balance speed and accuracy here so keep that in mind as you’re spending time surveying the scene. Whenever you’re ready, take the evidence marker that represents the number of differences you counted. Make sure you’re positive because once you grab a marker you can’t change your mind. The round continues until everyone but one person has selected an evidence marker. The last player gets three seconds to grab a marker then everyone proceeds to the Final Check. If the last player doesn’t grab a marker in time, they are eliminated from the round. Now it’s time to see the answers which happen to be on the back side of the color pictures. (Hope you didn’t peek!) Compare the two and count how many differences there are. The person with the evidence marker that shows the exact number of differences collects the green token which is worth 3 points. 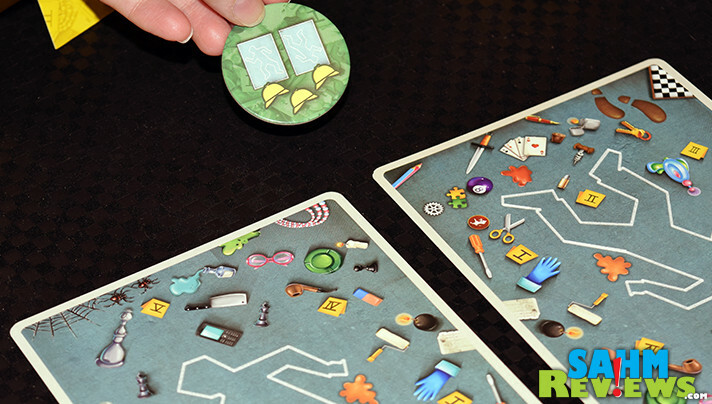 If no player guesses exactly, the green token is discarded. The player who has the evidence marker showing the closest number LOWER than the exact number takes a yellow token worth 2 points. If nobody has a number lower than the exact number then the person who took the green token also gets the yellow one! 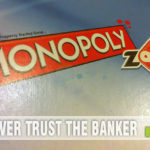 The player with the evidence marker closest HIGHER than the exact receives a red token valued at 1 point. If nobody has one higher than the exact number then the green token winner gets a red one. 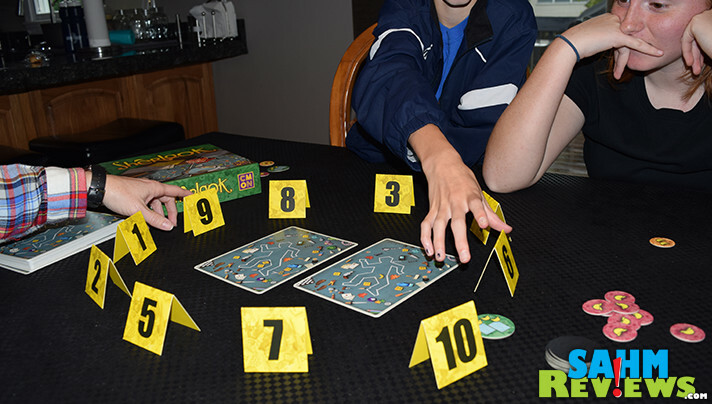 After the points are rewarded, the evidence markers are returned to their respective spots, a new green token is flipped to determine card placement and two new cards are drawn. Game continues for 10 rounds and the player with the highest points is the winner. Sherlook plays up to seven and as you can see from the scoring process, the more you have playing, the better. 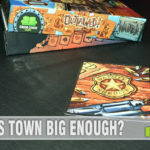 It’s a game that’s great for detail-oriented people and lasts under a half hour. 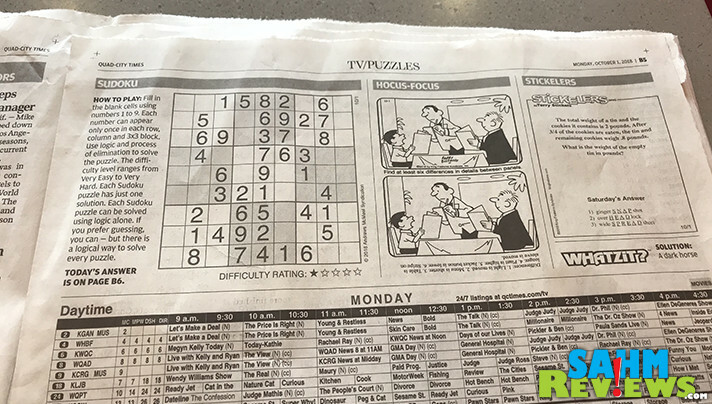 If you’re like me and miss playing the “find the difference” puzzles in the newspaper, then pick up a copy of Sherlook on Amazon or from your local game store. As always, visit the CMON website or follow them on Twitter and Facebook to “find the difference” in their current listing of games. Have you ever witnessed a crime scene up-close? I love games that have some mystery and thinking, makes me feel like a detective and I secretly wish that was my job. I like puzzles, especially the find the difference variety. I think my family would like this game. Thanks for the info! My family loves playing games! This game really does look like a crime scene. Ha! It looks to be a lot of fun with a bit of detective work. This sounds like a great thinking game, I’m a big Sherlock Holmes fan so I’d like acting the detective …evaluating the smallest of clues. He always noticed what was different, a skill I’m not sure I have, but I’d have fun trying. This Sherlock Puzzle game is fantastic! I love games like this and I am going to have to get this for the trio and me to enjoy family game night together again in our new place. This puzzle looks pretty interesting. I would love to play this with my family this weekend!